The purpose of this appraisal is to obtain insurance coverage. It is very important to have all the information described on the appraisal so that in the event of a loss the item could be replaced by a third party that has never seen the item. The purpose is to determine value for the attorney who is handling the estate for probate purposes. 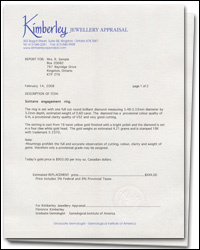 This appraisal is also used by executors or family to divide the jewellery fairly between the heirs. Florence can also help you sort a jewellery collection to determine what needs to appraised, and what is of sentimental value. The purpose is to determine and document current vaues for dissolution of commonly held property. The purpose here is to determine a value after a loss or theft. This type of apprasial requires the client to furnish photos, receipts, or previous appraisals if avialable. If no information is available the client is asked to describe and view catalogues to determine similar items available and from that a replacement value is determined.